That dadgum Instagram advertising! First thing, I’m minding my own business, scrolling and napping with one eye closed. Next thing I know, I am the proud owner of a pair of shoes that look like gardening clogs and something orthopedic had a baby. I tried to wear them the other day and be all cool about it, start a new thing maybe, but it felt like any moment I’d be pulled into a diner kitchen to haul some raw chicken around. ABORT ABORT! My attempt at high fashion has failed rather miserably. Which surprises no one, considering how long I ignored that jelly stain on my robe before I was forced to wash the dang thing. But I used to be quite the fashionista, I swear it. I mean, a Beastie Boys record around the ponytail doesn’t just happen to everybody, ya know? Even in the 7th grade, I knew I had the gift. The fact I did not start a hot new trend exploding throughout the middle school is beside the point. Cuz later I owned a pair of hammer pants and well, what other proof you need then? Nowadays, I’m feeling slightly less fashion-y. Like, if it doesn’t have some Dr. Scholl’s-type padding in it, I’m not much interested. And the more material my underwear can have, the better. Things need hoisted at this point in my life, let’s just say. OMG, am I still married? I don’t even know. 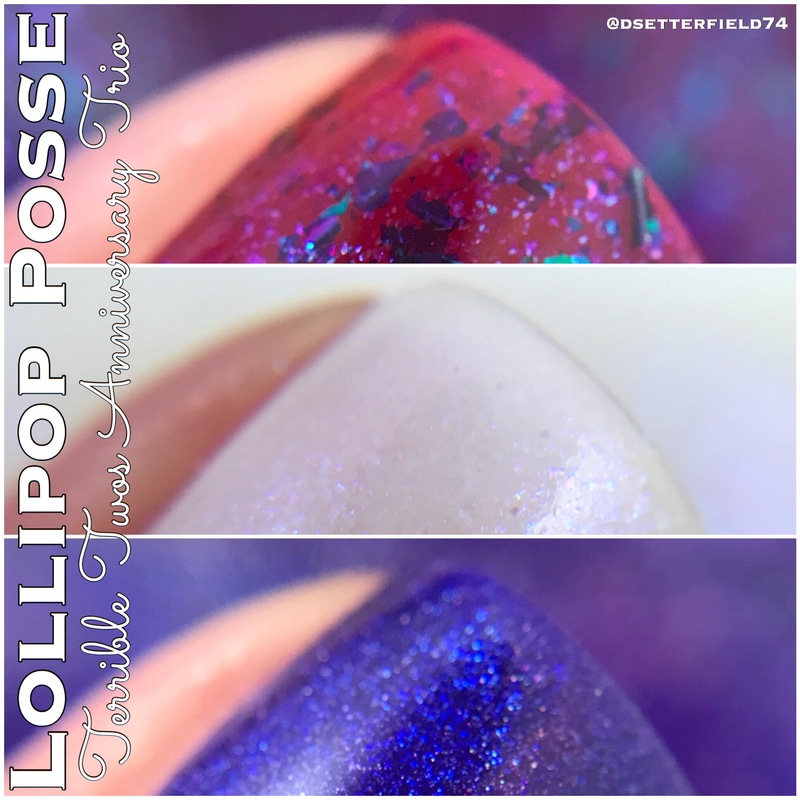 Miss Karen from Lollipop Posse Lacquer sent me some beauties to review for you today. The business is turning two, and to celebrate, the Terrible Twos Anniversary Trio is coming your way! Did you just pee a little? Cuz I sure did. 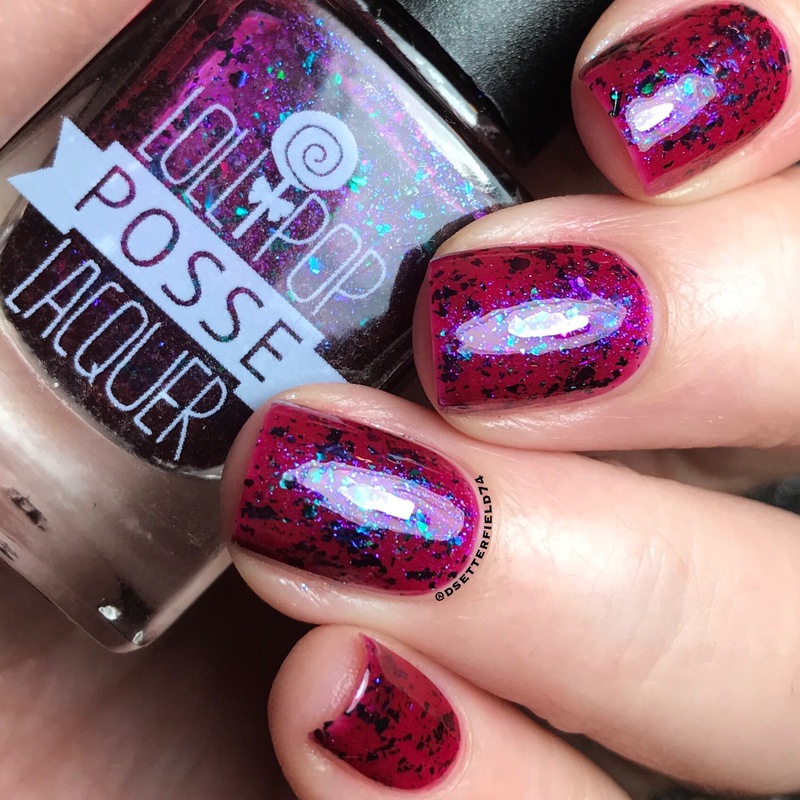 This trio is inspired by one of Karen’s favorite literary characters: Delirium, from Neil Gaiman’s Sandman graphic novels. Let’s take a look! 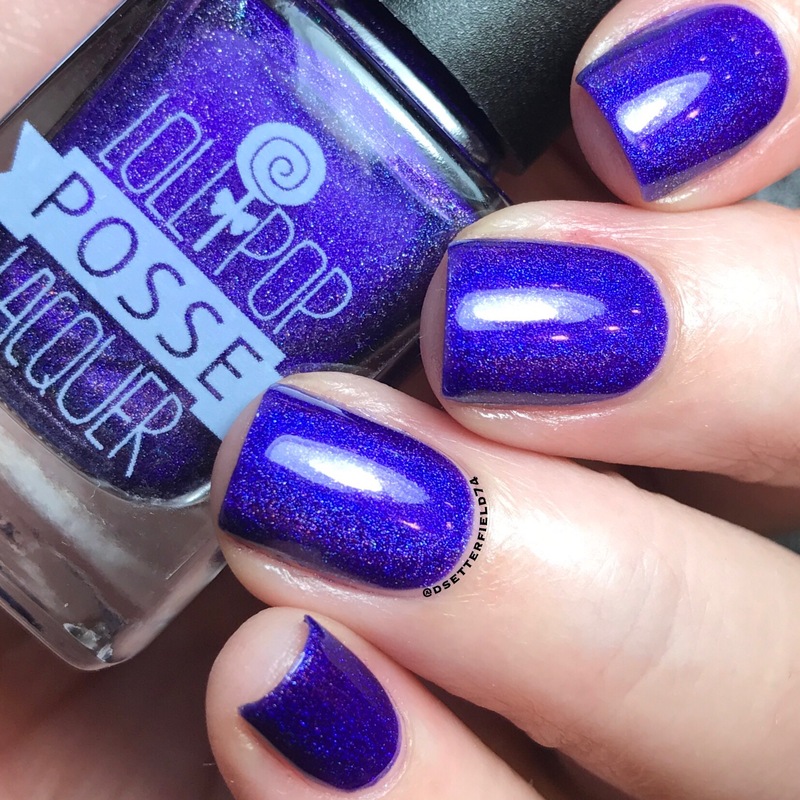 This one is a stark white crème packed full of various sizes of blue and purple shimmer. 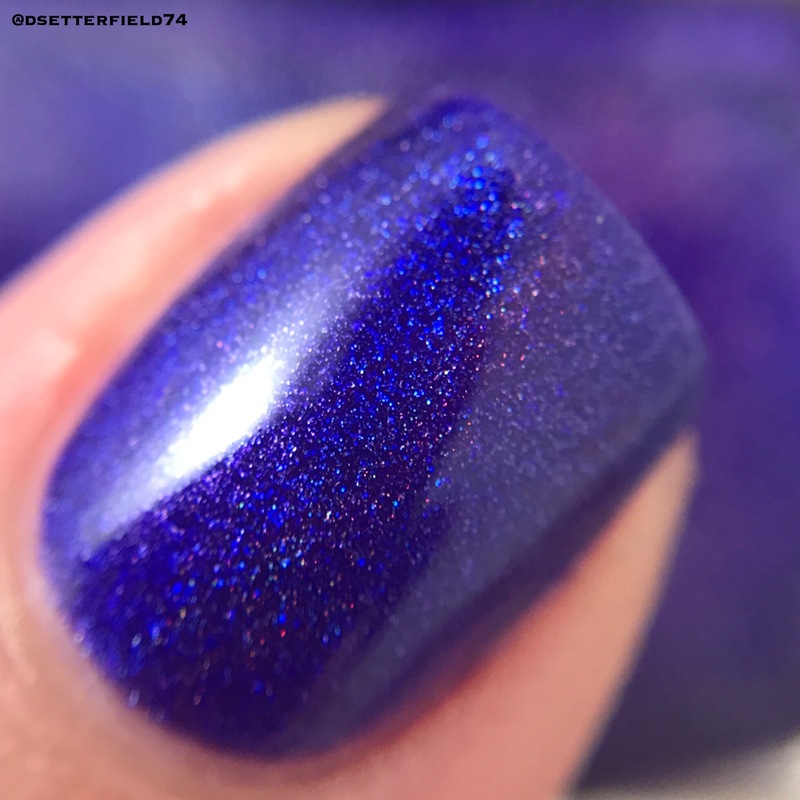 It’s slightly sheer at two coats but three coats was pretty close to opaque, and unless you’re walking about with your microscope and a pack of people all up in your business, no one can tell much about the sheerness anyway. 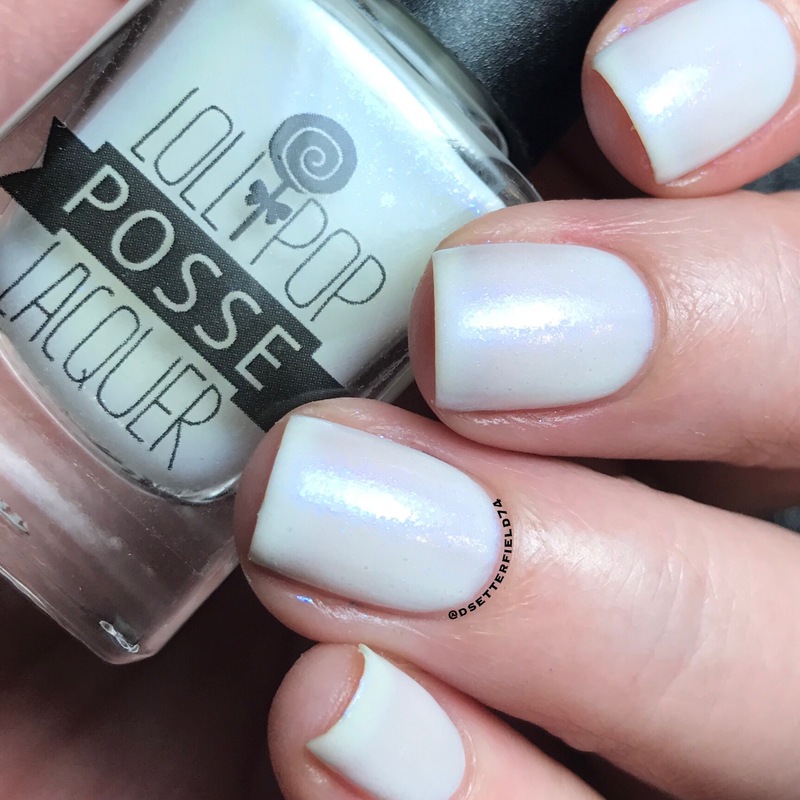 It’s a really pretty, delicate shade; all smooth and creamy. Shimmer was a bit shy in my photos, but it’s much more evident in real life. See, there’s that shimmer! Drooling has officially commenced. 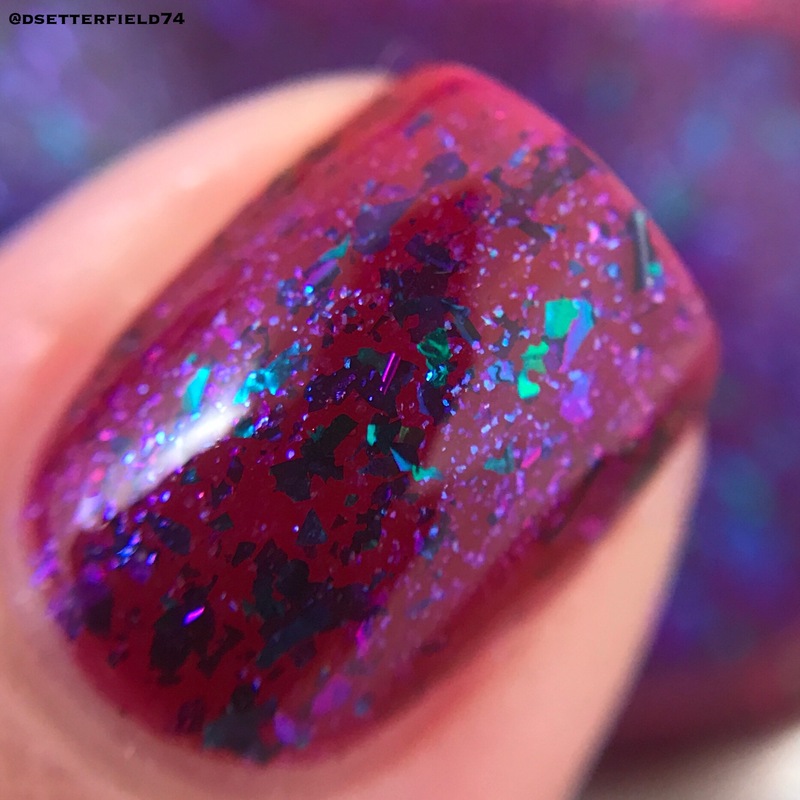 This one is a magenta crelly that suspends blue to green shifting simmer and blue/green/purple ultra chrome flakies. This is the very first UCC flake Lollipop Posse has made available to the public, and so now we need a trillion more cuz that’s how this thing works. Isn’t it freaking glorious? I want this on all the surfaces. Mine AND yours. Brain has officially stopped holding my mouth closed. The Ugly Ecstasy Face is so dire. DEAD. Someone pass the smelling salts, stat. Cuz the flakies got me. They got me good, guys. Despair: You cannot seek Destruction and return unscathed. Despair: Delirium has been scathed enough in her time. This one is a violently violet, blurple leaning linear holographic with a neon blue arc in the holographic flame. Which is secret polish lingo for GET IT ON YER NAILS. It’s magnificent. 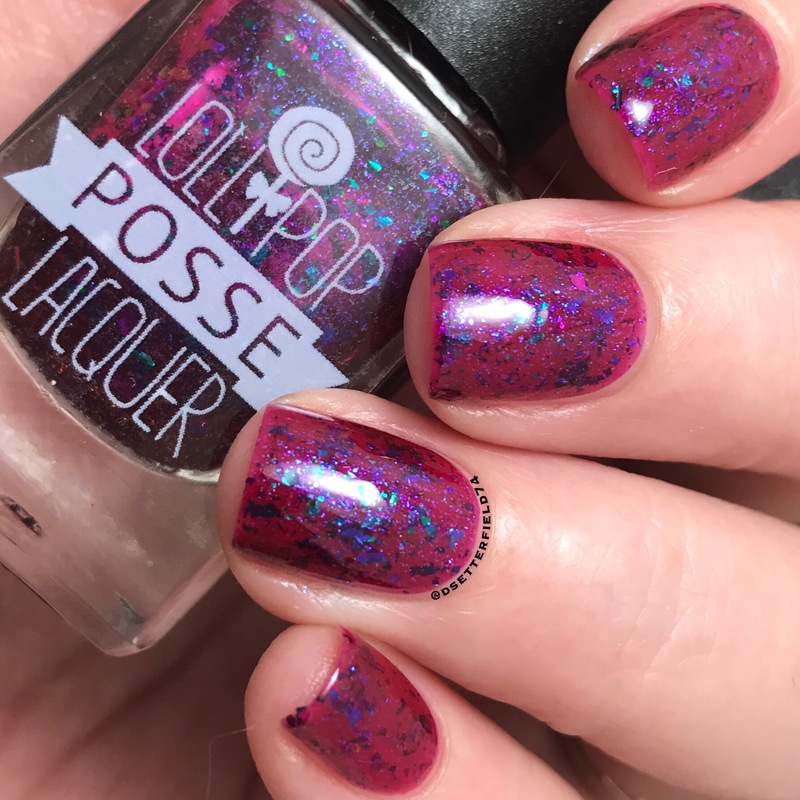 Seriously, you think she’s just your basic purple holo, but NOT EVEN CLOSE. Under the lamps, that blue comes out and she a fancy lady, at minimum. Gah! Who’s still upright? Nope, me neither. If you’re somehow turning your back on all this pretty, I feel sad about your brain. 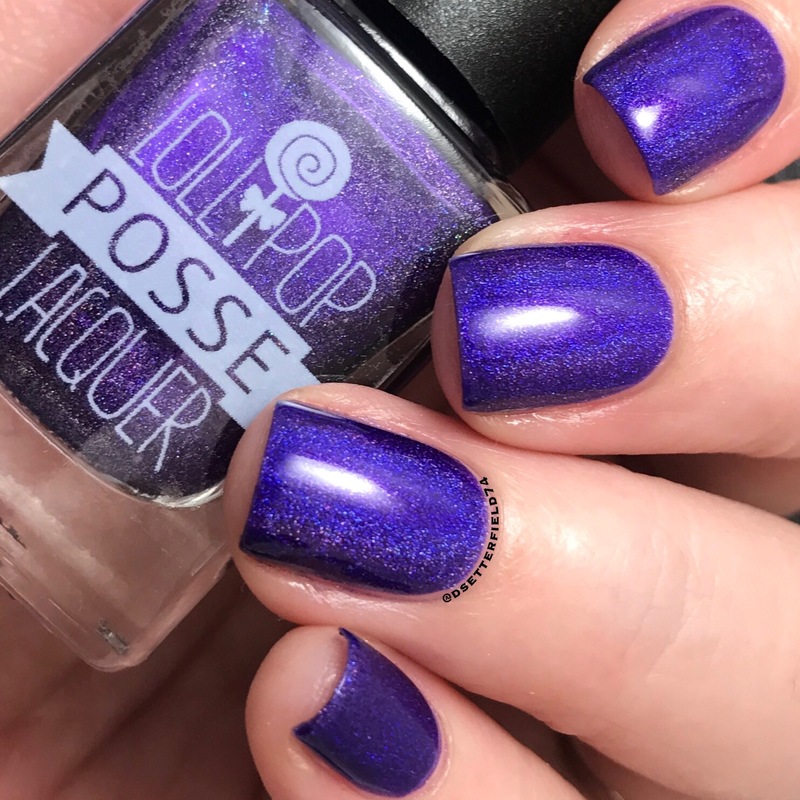 Cuz it’s a blue and purple extravaganza! and I can’t think of anything better. Unless this trio comes with a side of Leonardo, that is. 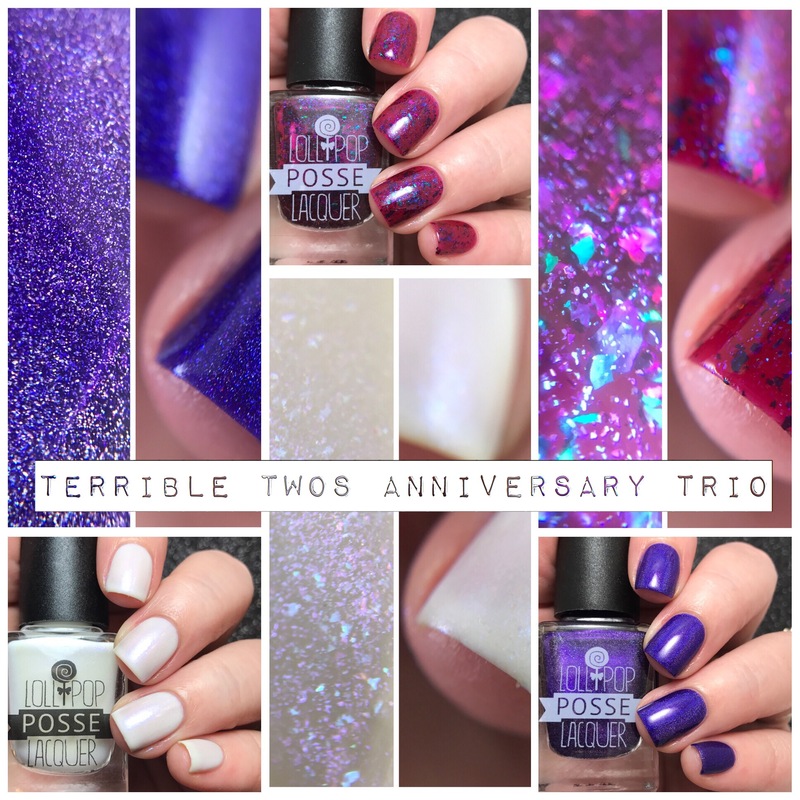 The Terrible Twos Anniversary Trio will release on May 23 at 8pm EST, which is the exact date of Lollipop Posse’s anniversary. So if you need an excuse to have a wine cooler on a Tuesday, this here’d be it. Trio price is $33.50 with free shipping, plus discounted international shipping for the first 24 hours after launch. Whyyyyyy, that’s a polish emergency if I ever heard one. Get your focus faces on, then. First in line? That’s YOU. You know, in case you’ve misunderstood how much you’re buying all three.